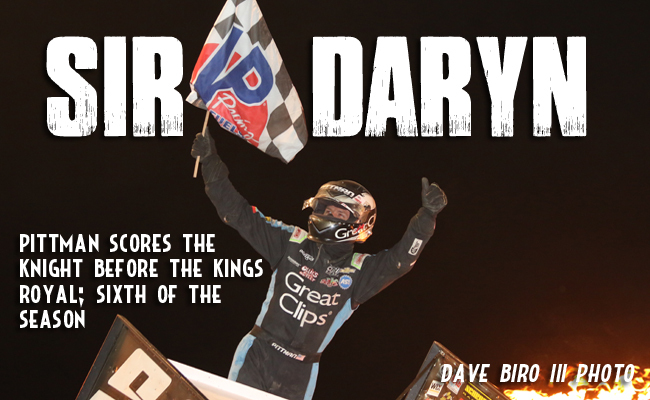 ROSSBURG, Ohio - July 15, 2016 - Daryn Pittman dominated the Knight Before the Kings Royal at Eldora Speedway on Friday night, as he cruised to his sixth World of Outlaws Craftsman® Sprint Car Series victory of the season. For Pittman, the win was his first at the historic half-mile oval in Rossburg, Ohio since May 4, 2013. Even with the victory, Saturday night's $50,000-to-win Kings Royal, one of the most coveted wins in all of motorsports, was on Pittman's mind. "Hats off to this Great Clips team. We had a really great car," Pittman said. "It doesn't matter how good you are tonight. We can't do exactly what we did, tomorrow night. Tomorrow night is a new race track. Try to go after my second Kings Royal. It was a pretty special win in 2008." The win did not come without a little adversity for the No. 9 Great Clips team though. Pittman, started on the outside front row and battled to the lead on the opening lap. As he put distance between he and second-place Joey Saldana, he bounced off the wall in turn four. "I was out front and I was slow and I didn't think I was getting through three and four fast enough and tried to pick up the pace a little bit," Pittman said. "I didn't think I was close to the fence, and I hit it and hit it hard. I ran about the next three laps thinking I was going to have a flat or did some damage but luckily the car held on." Donny Schatz was charging in his No. 15 Bad Boy Off Road/Chevrolet Performance/J&J. After dispensing with Shane Stewart, Schatz caught the No. 83 of Joey Saldana and looked for a line around. The two were side-by-side as they worked to complete lap 10 but Saldana held the spot. A lap later, Schatz got another run on Saldana and took over second as the two dove into turn three. As Pittman worked his way through traffic, Schatz closed the gap briefly but then Pittman began to pull away again. "The (No. 9) car was awful good," Schatz said. "I couldn't even get through traffic… (We were gaining on Pittman) until the fuel load came off." Rico Abreu, who started ninth in his No. 24 Abreu Vineyards machine, worked his way through the field and by lap 16 was challenging Saldana for third. Three laps later, Abreu got around Saldana to take over the final podium position. "I searched around and searched around and found the happy medium on my car," Abreu said. "I moved the wing back a little sooner than some other cars and that's how I gained those spots." Through the closing laps, Pittman adeptly worked his way through traffic and built a sizeable gap on Schatz, Abreu and the field. When the checkered flag fell, Pittman scored his sixth win of the season. Schatz and Abreu matched their finishing positions from the night before at Eldora. "It's a dream come true to come drive for this team and I'm just doing my part to try to stay in it," Pittman said of Kasey Kahne Racing with Mike Curb. "It was a great win for us." Schatz said his Tony Stewart/Curb-Agajanian Racing team tried some things in the Dash that did not quite work out. He said that coupled with a slick racing surface made for a challenging night. "You never know what tomorrow night will bring. We'll look forward to a good day tomorrow," Schatz said. David Gravel, who won the inaugural Jokers Wild on Thursday night scored his third quick time award of the season on Friday after posting a qualifying lap of 13.600 seconds. Brad Sweet was the night's KSE Racing Hard Charger, advancing eight positions to finish in fifth. RACE NOTES: Daryn Pittman's win tonight was the sixth of the season for his Kasey Kahne Racing with Mike Curb team… Pittman last stood in victory lane at the legendary Eldora Speedway on May 4, 2013… Donny Schatz continued to extend his points lead on Friday night. He now leads Brad Sweet in second by 186 points… Brad Sweet was the night's KSE Racing Hard Charger, advancing eight positions to finish in 12th… Donny Schatz and Rico Abreu repeated their performances from the Jokers Wild the night before, standing in victory lane in the second and third positions… David Gravel picked up his third quick time award of the season after posting a lap of 13.600 seconds around the half-mile oval. CONTINGENCY WINNERS - MSD Ignitions ($25 cash): Brent Marks; MSD Ignitions ($50 cash): Daryn Pittman; Penske Shocks ($50 cash): Donny Schatz; JE Pistons ($50 cash): Joey Saldana; VP Racing Fuels ($50 cash): Shane Stewart; Edelbrock ($50 cash): Chad Kemenah; Comp Cams ($50 cash): Brad Sweet; Morton Buildings ($50 cash): Trey Starks; Cometic Gasket ($50 cash): Brad Sweet; Super Flow ($50 cash): Logan Schuchart; Craftsman/Sears ($100 cash): Bryan Clauson/Trey Starks; KSE Racing Products ($100 product certificate): Brad Sweet; Comp Cams ($50 product certificate): Daryn Pittman; JE Pistons (Set of Rings): Logan Schuchart; JE Pistons (Set of Rings): Brent Marks. SEASON WINNERS: Donny Schatz - 14 (Volusia Speedway Park on Feb. 14, The Dirt Track at Las Vegas on March 4, Stockton Dirt Track on March 18, Stockton Dirt Track on March 19, Silver Dollar Speedway on April 2, Lincoln Speedway on May 19, Weedsport Speedway on May 22, Lincoln Park Speedway on June 8, Knoxville Raceway on June 11, River Cities Speedway on June 17, Rockford Speedway on June 29, Badlands Motor Speedway on July 3, Cedar Lake Speedway on July 9, Attica Raceway Park on July 12); Brad Sweet - 7 (Volusia Speedway Park on Feb. 13, Volusia Speedway Park on Feb. 14, Cotton Bowl Speedway on Feb. 26, Ocean Speedway on April 1, Bakersfield Speedway on April 15, Plymouth Speedway on May 13, Badlands Motor Speedway on July 2); Daryn Pittman - 6 (Royal Purple Raceway on Feb. 27, Perris Auto Speedway on April 16, USA Raceway on April 18, New Egypt Speedway on May 24, Jackson Motorplex on June 24, Eldora Speedway on July 15); Shane Stewart - 5 (Arizona Speedway on March 6, Devil's Bowl Speedway on April 23, Lawrenceburg Speedway on May 30, Granite City Speedway on June 15, Brown County Speedway on June 19); David Gravel - 4 (Thunderbowl Raceway on March 12, Tri-State Speedway on May 14, I-96 Speedway on June 6, Eldora Speedway on July 14); Joey Saldana - 4 (The Dirt Track at Las Vegas on March 3, Devil's Bowl Speedway on April 22, Jacksonville Speedway on May 4, I-80 Speedway on June 22); Kerry Madsen - 2 (Eldora Speedway on May 6 and 7);Bill Balog - 1 (Beaver Dam Raceway on June 25); Lance Dewease - 1 (Williams Grove Speedway on May 20);Chad Kemenah - 1 (Fremont Speedway on June 3); Jason Johnson - 1 (Placerville Speedway on March 24);Terry McCarl - 1 (Knoxville Raceway on June 10); Logan Schuchart - 1 (Cedar Lake Speedway on July 9); Jason Sides - 1 (I-30 Speedway on April 26); Greg Wilson - 1 (The Dirt Track at Charlotte on May 27). World of Outlaws Craftsman® Sprint Car Series Statistical Report; Eldora Speedway; Rossburg, Ohio; July 15, 2016.